"Animals not only teach us about the type of person we want to be....but they unconditionally love us along the way"
Recently our local paper wrote an article about how Reiki and Animal Communication work can help your pets. I was very grateful to help spread awareness of these amazing practices. You can check out the article online by selecting the link below. Some may look at this picture and wonder what is the big deal if you practice Self Reiki each day. When we think about the healing and balance that Reiki can bring to us mentally, emotionally and physically, I think the better question is why wouldn't we want our practitioner to practice Reiki every day. 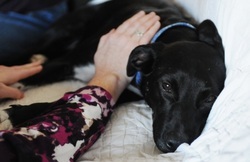 When practitioners offer Reiki to their clients whether 4 Paw or not, they often tell their clients how wonderful Reiki is for healing on many levels. That it helps to bring balance to your body, mind and spirit. We want that balance for our clients. But our clients should expect that from their practitioners. If the practitioner is not practicing Self Reiki daily then how can they stay balanced? It is the foundation of being a 'good' practitioner for our clients. 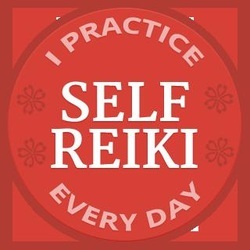 So if you are new to Reiki and looking for a practitioner, make sure to ask them if they practice Self Reiki every day. It is a very important question to ask. If you are looking to schedule an appointment or have more questions, please Contact Me for more information. Some of the 4 Paw clients I work with as well as some of my human clients come to me with chronic illnesses. Often I am asked how can you help me or my pet? Reiki has the ability to put our bodies in a space of deep relaxation. This elicits a response in the body that allows it to heal. Healing may mean less pain, better sleep, better digestion or literally healing from the chronic condition. Imagine when you do not feel well. Your mind and body are not functioning as well as it should. Often your body is constricted trying to fight what is 'attacking' it. So picture being able to relax your organs, your muscles, your nervous system.... would that not bring about enhanced functioning of the body? When something is constricted it does not work nearly as well as when it is relaxed. Even if the result is that the medicine is absorbed better so that you can heal from the illness is healing not the ultimate goal? With Reiki I never close any doors. I have seen many clients achieve such beautiful results after even just one Reiki treatment. This is the story of Sweet Daphne. I was contacted a few months ago to work with her and her friend who I like to call Mr. Rudy. They had become aggressive towards each other after living together all of their lives. The owner had them checked by a veterinarian and talked to others about what things she could try to help them but it seemed they still were not themselves. When she contacted me I told her I could not promise that we could 'fix' the aggression but I felt the Reiki would bring healing to both of them for what they needed. I also felt that the Animal Communication work would help bring insight into what might be at the root of the problem. The interesting part is all of this work has been done from a distance. I have never met them in person yet I feel so connected to all of them, Daphne, Rudy and their owner, Anita. Anita has always been so open to the 'healing' potential of Reiki and to the communication work. In my experience when the owners are open to the healing potential of these practices, it helps to accelerate the healing within their '4 Paw' friend. The real turning point came during a distance Reiki and communication session when Daphne began to indicate that her eyes were bothering her. Her owner monitored her but after the second session when she was showing me she needed an eye exam the owner decided she needed to take her to the veterinarian. Her eyes had started to show physical signs by this point. 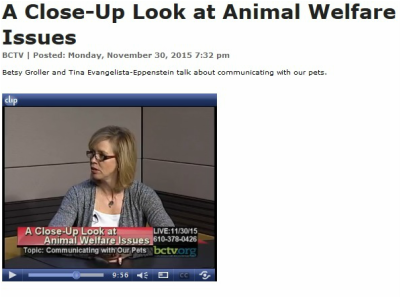 The veterinarian confirmed what the owner was seeing and what Daphne was telling us that she was having eye problems. This new information helped the owner understand that perhaps this was playing a role in her aggression. The Distance Reiki has brought healing to both Daphne and Rudy, allowing them to feel more balanced and relaxed. While there is still some times of aggression it appears to be less than when we originally started. If you would like to read the owners testimonial please click here. I am very grateful that Sweet Daphne and Mr. Rudy and Anita came into my life. They have taught me so much about the true power of healing. Animal Communication and Intuitive work involves a deep loving connection made between a practitioner and a client. Intuitive impressions can relate to physical, mental or emotional needs of the clients. They may come in the form of images, words or feelings that the client relays to the practitioner. In particular, Animal Communication can deepen the connection between the owner and their animal companion. Many of my clients have found animal communication to be especially helpful when one of their animals has passed. I have worked with animals approaching the end of their life, animals that have passed, lost animals and animals in need of healing, mentally, emotionally and physically. Animal Communication has brought healing and peace to not only the animal but to the owner as well. Most of my sessions are done remotely so I do not have to be in the same location of the client. Please Contact Me for more information. Reiki which means "Universal Life Force Energy" is a healing energy system that was discovered in Japan in the early 1900's. It is gentle and non-invasive and can heal on many levels. Reiki always heals on some level whether that is physically, emotionally or spiritually, even if it does not “cure” the physical body. It is especially wonderful for animals as it is such a gentle and loving energy. Animals respond intuitively to Reiki energy which assists them in healing emotional, behavioral, and physical illnesses and injuries. At times the changes we see may only be subtle but it generally heals on a much deeper level. Other times evidence of healing can be seen quite dramatically. When working with an animal, Reiki allows me to connect with them very deeply. Often intuitive impressions are received of specific areas that need healing or other areas that need to be communicated to the owner. This often assists the animal and the owner bring about a deeper level of healing. My clients have found that this deep connection is especially helpful with their missing animal companions. Animals are not the only ones that benefit from Reiki; people and plants can also benefit. I offer Reiki treatments to people as well. I view each client as unique and work to help bring them the highest level of healing possible. The beauty of Reiki is that it will bring the client the level of healing that is needed at that time, whether it be physical, mental, emotional or spiritual. Intuitive readings can provide insight to the client in a particular area in their life or just guidance in general. The readings should be used as a guide and often once reflected upon bring to light what the client has known deep inside themselves. Sometimes readings may bring to the surface areas in our life we may choose to heal or to do further work. I work with my spiritual guides and Angels to connect with your guides and guardian angels to bring to light what messages they have for you. If you have an specific questions those can be addressed as well. The readings are generally done through email. I generally work with one or more Angel decks and include information from the decks in the reading as well. 4 Paw Reiki will be offering Mini-Reiki treatments to our 4 Paw friends for $10/mini-treatment. Learn how Reiki can make a difference in your pet's life and your own! Where: John C. Rudy Park in York, PA.
Come learn how Reiki can benefit your animal companions! Learn how to offer Reiki from a distance. Reiki is not bound by time or area. It is amazing practice that heals on many levels. Prerequisite - Reiki Level I. Contact me for more information, private training available. If you would like to receive Reiki for you or your animal companion in person or at a distance or schedule an Animal Communication Session; please Contact me. You may also check out my Services page. Reiki and Animal Communication can help many animals suffering physical and emotional trauma. If you know of an animal shelter or rescue group that would be interested in learning more about Reiki or Animal Communication and how these services could help their animals, please Contact Me. Do you think your veterinary practice could benefit from Reiki or Animal Communication? I'd love to talk to you. I could provide an introduction on how Reiki and Animal Communication can support your clients and staff. Please Contact Me for more information. Interested in learning Reiki? Please Contact Me for more information. Are you or your organization interested in finding out more about Reiki? I can conduct an Introduction to Reiki or Animal Reiki workshop at your location. Please Contact Me for more information. Check out these wonderful custom pet beds on their Facebook page.